Surviving the toughest field testing, the Kukri boasts excellent test results in chopping and basic field use. 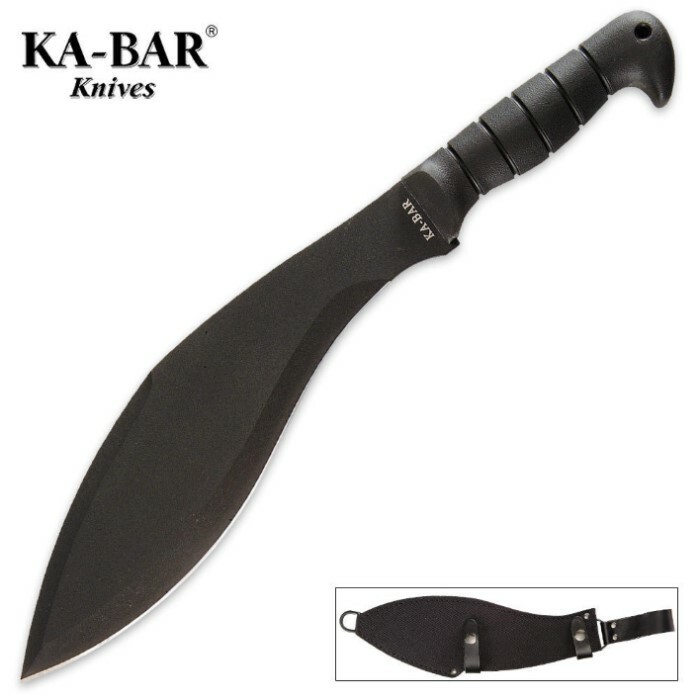 Equipped with a 11 1/2" 1085 Carbon steel blade with a Kraton G handle. 17" overall. Includes a leather sheath. I must say as my first purchase from Trueswords this far exceeds my expectations, not only was the shipping fast but it came in with no damage what so ever (not even the box!). First thing to mention is the sheath is okay, (Mines came in stiff and i had to wear it in before the kukri could slide in properly) its not much to worry about and it does its job but don't be rough with it which you should not be doing in the first place. The blade is incredibly sharp (cutting paper like butter) and durable, don't expect to be sharpening this often. The metal is tough and can take on any job/abuse you can give. The handle feels great whether wet or dry, and you will naturally use a hammer grip as this is specializing in chopping but don't worry about your grip slipping the pommel prevents it from flying out of your hand (be sure to wrap your wrist and use the hole in the handle for safety like a Wii controller). Overall this is an excellent purchase for the quality and i recommend getting it. I bought this several weeks. The blade is good and so was the blade worth the money I spent on it. You should buy it you will not be disappointed! I've had mine for 7 years and put it through a lot of extreme abuse. I'm starting to look at a replacement now, as the tip has broken off and there are chunks missing from the blade. Also, as others are saying, the sheathe falls apart quickly. This may sound like a negative review, but I am confident that no other blade could have chopped through countless trees, (I cut down many over 2 feet wide) dug trenches in clay, chipped rocks to better shapes, hammered in nails, and even broken through a small safe. It also does intended jobs like clearing trails through brush with ease. However, due to the heft behind this blade, fatigue sets in quicker for strictly trail clearance than using a lighter weighted machete. The grip is excellent, but you will still get nasty blisters if you don't use gloves during prolonged use. Overall, it has served me far beyond what I expected, and I will definitely be purchasing another one. I picked one of these up from a fair when i was 15 years old...I'm now 23 this blade sharpens well and has taken on anything i've thrown it at or cut with it..super durable blade and handle..the sheath is kinda lame but after 8 years of abuse it still holds up well, I'd recommend this Kukri to anyone looking to get a good quality blade!! BEST machete u can ever have it does everything it chops better than my axe and slices anything in sight and greqt steel 1085 high carbon steel and coated and straight out of the box it was razer sharp cut like butter when I did bottle test JUST WONDERFULMACHETE THANKYOU TRUESWORDS WILL BE DOIN REVIEWS ON YOUTUBE AND RECOMEND PEOPLE TO YOU!!!. My side arm. I choose to carry a knife, and THIS KNIFE is my right hand. The scabbard is lose fitting and low end, so if you buy this knife you should also get it a scabbard it deserves. The knife is perfect for the price, even though it is made in Taiwan. The black finish makes this blade feel like the fang of Cerberus, and it handles well. If you need a chopper, cleaver or a slasher, this blade will serve you well for a hundred years. Therefore, this is a blade you will pass down from father to son and mother to daughter. Amazing blade, extremely sharp. Great weight, makes for a solid chop.